Essentially calm seas and still mornings have been the norm here in Ft. Lauderdale. Deep sea fishing conditions have been favorable and offshore once again has produced some Mahi-Mahi around debris and current edges. Birds on open water schools and of course that is a plus. Blue Marlin out there as well with the Mahi. Fellow Captain Jeff landed a fish of approximately 100 pounds and we ourselves did battle with a fish well over ( well over) 300 for 3 hours before breaking the line. We’ll say well over again. That fish was on a 950 Penn spinner with 20 pound line and we were outgunned from the start. 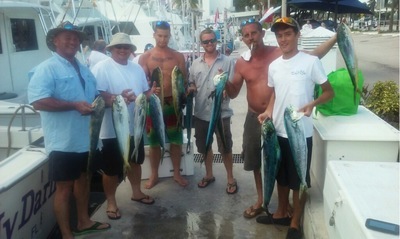 The fish took a hooked Mahi away from us right at boat side with a huge explosion. Amazingly the fish didn’t spool us and Capt. Chris did get Matt to within 20 feet or so of the leader once, but that was as close as she let them get. Some of the Mahi have shown in water around 700 feet and while that is a bit closer than the fish have been in we of course would like to see them even closer. That seems to be a starting point, as they are scattered about in much deeper water as well. Here’s hoping for between 600 and 700 feet in the coming days. Closer to shore the Kingfishing has been on the plus side with those Bonito continuing to get in on the action. Some Wahoo continue to hit the ice for us and we are thankful for this summer’s opportunities for them. A Sail here and there are some really good sized Cudas piling on and giving anglers a good pull. Strong current has hampered bottom fishing but there are some Snappers and Tiles available. Until conditions change we will most likely be spending more time off the edge and looking for those Mahi. It’snice to have them in the mix. Tight lines and good fishing.